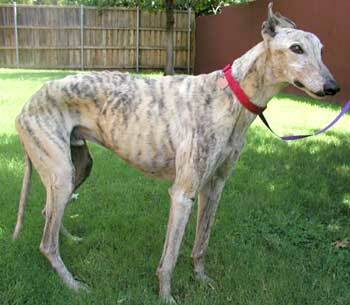 Charlie is a small 12-year-old light fawn (almost lemon-colored) brindle, who was born August 1991. Charlie came to GALT after being part of a "collector rescue"in Kaufman where over 100 dogs and cats were surrendered to agencies in the DFW area. 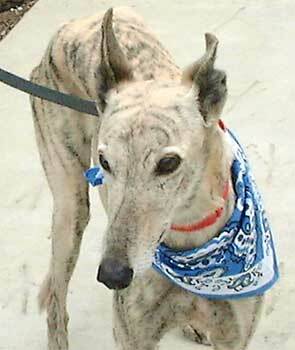 He came to GALT weighing only 48 pounds, and after a good teeth cleaning, Charlie's health is really good. His foster mom, Kris, has fattened him up, and he is "lookin' GOOD"! Charlie is a very special boy who deserves to spend the rest of his life in the lap of luxury, basking in the love of humans. 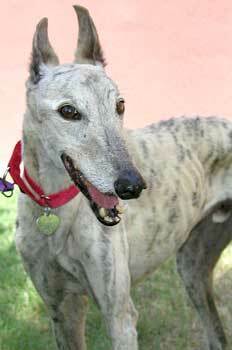 He is living with two other Greyhounds and a Labrador Retriever and loves having lots of attention and affection. It is not known at this time if Charlie is cat or small animal tolerant. Charlie is quite a character and very active to be 12! He gets excited when it is time for our evening walk and does a little "Happy Dance" with his front feet and his tail wagging. It is safe to say, he really enjoys going on the evening strolls in the neighborhood and is great on a leash. During my days at work, he has been staying in the kitchen behind baby gates and has had no accidents. He loves sleeping on the big fluffy bed and in his words, "life just couldn't get much better than this"
until he finds his forever home! He is cute as a bug with really alert ears! He is eating well and loves to turn circles and get cozy with his bed and blankets. He tries to keep up with my grey, Sophie, and my other foster girl, Carrie, but he is just not quick enough. Charlie doesn't mind having another grey around, but he sure does enjoy his attention and scratches in all the right places. He is super on a leash and walks right at your side.